With Condo inventory at all time lows, and prices continuing to surge upwards, buyers are desperately leaping on pre sale developments. But it appears it’s not just the developers cashing in on this frenzy. Students and innocent bystanders are being lured by hundreds of dollars to sit in line for buyers hoping to get in on the condo mania. In an article titled ‘I was paid $400 to wait in line at condo Sale‘ Vice is reporting some hefty payouts. “It was around 4 PM on a Friday afternoon when I got the call. 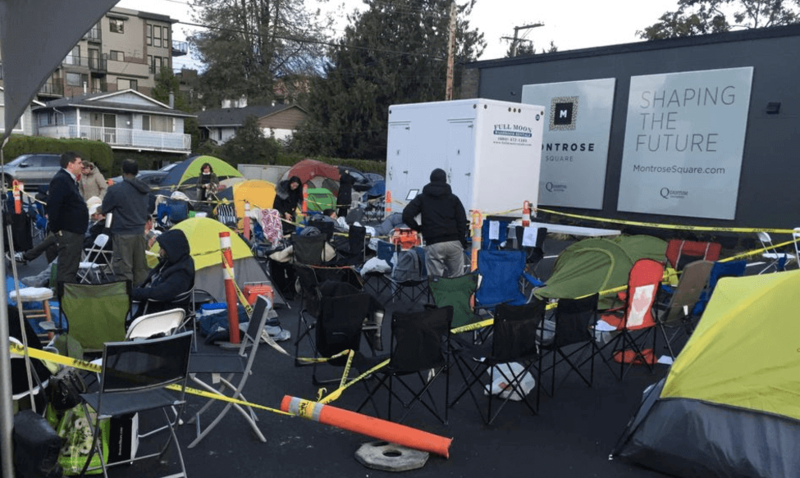 A friend told me her landlord, who worked in real estate, was offering $800 for two people to hold her spot in line for 15 hours at a condo presale in Port Coquitlam. As a freelance journalist, this was an offer I couldn’t refuse. Yes the mania has indeed spread to the unsuspecting suburbs where hoards of first time homebuyers are eager to enter the market. Dana Tong, a 23-year-old Port Coquitlam resident, has been in line since Wednesday evening, and currently sits as 21st in line. “For us, being a young couple and still living at home, the only reason that we’re prepared to pay this kind of money is that it’s a set price – you’re not going to get into a crazy bidding battle,” Tong said in a phone interview with Daily Hive while waiting in line. As i’ve mentioned many times, there are plenty of risks involved when purchasing a pre sale development that most buyers appear to be unaware of. For starters, you’ll have to get re approved for a mortgage once the building completes in 2-3 years. If heaven forbid prices pull back even a bit, or rates go up, the lender may not give you the same loan you’re approved for today, leaving you to foot the difference.